AAUW nationally offers great opportunities for students: grants, personal and professional development, leadership opportunities, networking, community, and more. Join us! Affiliation in PA is free at the national and state levels. Branches may or may not have dues for students; find a branch near you and ask. Student affiliations offer important benefits. E-Student Affiliations (E-SAF): Available only to students who are enrolled at a College/University (C/U) Partner Member institution. Student Affiliations (SAF): Available to students who are enrolled at a qualified College/University that is NOT an AAUW C/U member. National affiliations for undergraduates are free if your college or university is an AAUW member, and only $17 for undergraduates whose institutions are not C/U members. Find out whether your college or university is a member. Graduate students can also join the national AAUW at the introductory rate of $18.81 for the first year and $49 per year after that. Consider joining the state and local branch as well to be connected to a local community. Find a branch near you. Join AAUW-PA, too, and pay NO PA State dues while you are a student!! 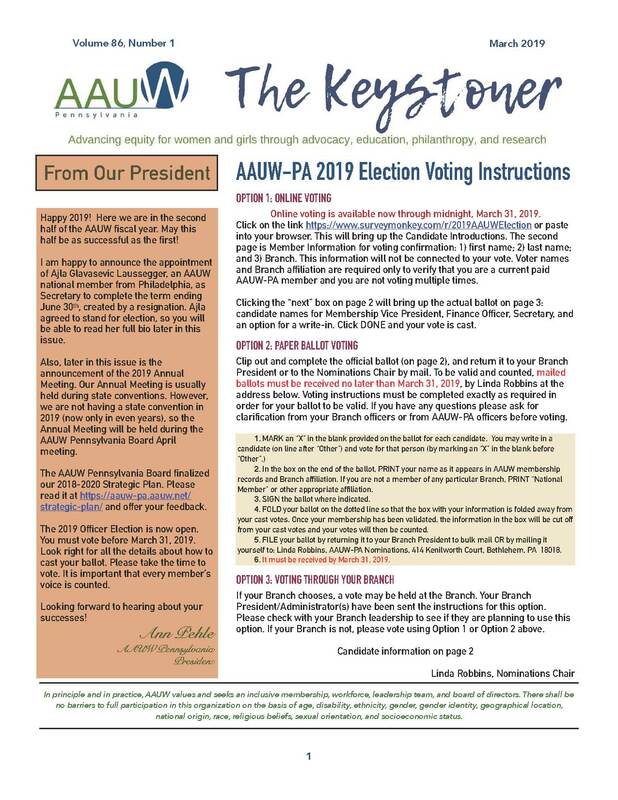 Contact the AAUW-PA Membership Vice President. Join your local community’s branch. Contact the branch Membership Vice President for information about branch dues (many branches do not charge students dues) and to affiliate. Find a branch near you.